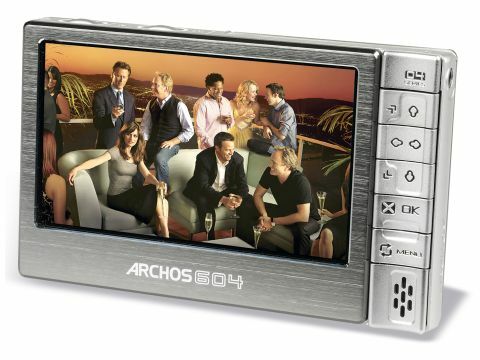 PVRs are traditionally chunky set-top boxes, but Archos has come up with a revolutionary fix, a docking station that turns its portable media player into a fully-functioning personal video recorder - a sort of portable PVR, if you will. Archos is something of a luxury brand in PMPs, and the Archos 604 system isn't cheap, but then it does also have a 30GB hard disk and a usefully large 4.3-inch LCD widescreen display, a respectable 5-hour battery life (16 hours without the screen), it weighs just 315g and it's only 16mm deep. So how much can you get on a 30GB disk? Fortunately, Archos has built MPEG-4 recording into the 604, so you can store about 40 movies, or 300,000 photos, or 15,000 three-minute MP3s. These figures depend on the quality and resolution you choose; movies for playback on a regular TV will require more space than low-res movies for the 480 x 272 screen. The traditional way to get stuff on your PMP is to download from your PC via the high-speed USB 2.0 port, and it can handle all the usual suspects (DVD quality MPEG-4, AVI, DiVX, copy-protected Windows Movies in WMV9, WAV, MP3) except Apple's restrictive iTunes formats. But if you don't have a PVR, or you have a set-top box PVR with stuff you'd like to watch on the move, the DVR Station adds a new way to fill your disk. You can take your signal in via composite or S-video, and stereo audio, and output it via composite, S-video or even component video with digital audio. Scart adapters are supplied and the arrangement lets you see the Archos's menus on the TV, as well as watch films or photos from the hard disk. Shame it doesn't have a Freeview tuner. The DVR station doubles as a charging cradle, it has its own remote control, and an IR emitter to control your satellite or Freeview box. There are even two USB ports, allowing you to copy from other USB storage devices, and link to either a PC or (if you're lucky) to a PVR with a USB port so you can transfer files direct. You can either record live to the Archos (sadly, you can't pause live TV) or set up a VCR-style timer to make a recording when you're not in, although you'll have to leave your 504 behind for that! The 604 itself is simple to use, although the dual-function buttons take a little getting used to. The remote is basic but sufficient to play files and navigate the menus. There are folders for video, music, photos and the built-in audiocorder, and if you interrupt playback you can resume from the same point. There's also support for playlists and slideshows. The 16:9 screen boasts 16 million colours and provides a crisp picture, although it's a little too small to share with another viewer. Despite the screen's size, it provides appreciable colour with subtle tones, deep blacks and close-up detail. Full-screen video playback was smooth, and DVD-quality files looked good via component video. Recordings are limited to 640 x 480, which is fine for being on the move, but not so hot played back on another TV. The built-in speaker is loud enough for home use but you'll need headphones in a noisy environment, and music sounds very good, although movies aren't quite the DVD surround experience. Extras include a voice recorder, and there's an optional AV output cable if you want to play back without the DVR station (composite only). If video quality isn't your top concern, it's a worthwhile alternative to a DVD recorder, giving you the ultimate in portability and sharing, and easy access to downloaded or home-made video files. If you think this is an expensive alternative, the Archos 504 has a whopping 160GB HDD and adds £320 to the cost. There's also a WiFi-equipped version of the 604 with added web browser/email, and the 704 (also with optional WiFi), which has a 7-inch screen you can watch with a friend.